Pick up from your hotel and transfer to Phuket Fantasea. Arrive at Phuket Fantasea and enjoy the dinner buffet. The restaurant seats 4,000 and offers a grand buffet of Thai and International cuisines. After dinner there is time to explore the festival village before the show starts. Here you will find games, handicrafts, entertainment and shopping outlets. Show gates open so you can go inside and take your seat. Phuket Fantasea Show starts. The performance runs for 1 hour and 15 minutes. The Phuket Fantasea show finishes. You will be transferred back to your hotel. You will arrive back at around 22.30 - 23.00. Be amazed by the ultimate Las Vegas style show. Phuket Fantasea is the ultimate in Las Vegas-style theatrical productions. Created by international experts and local professionals. This audio-visual extravaganza incorporates - for the first time - nine stunning show themes. Thai culture, magical illusions, 4-dimensional effects, aerial performances, acrobatics, indoor pyrotechnics, special effects, elephant circus and stunts - into one unforgettable theatrical masterpiece. 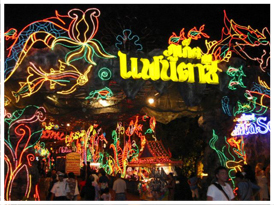 Phuket Fantasea is guaranteed to thrill and delight visitors of all ages and nationalities.